Buying an office chair is an important consideration that calls for an individualistic approach. An average office chair is designed in a way that will prove sturdy only for people with an average weight. If a person slightly on the heavier side sits on it, the chair will be prone to breakdown due to the make which is not strong enough. Hence going for chairs that are designed for both tall and overweight people would be cost effective. Here is a comprehensive guide that will take you through all these factors concisely. Before purchasing chairs distinctly for overweight and tall people, make a choice between mesh and leather chairs. 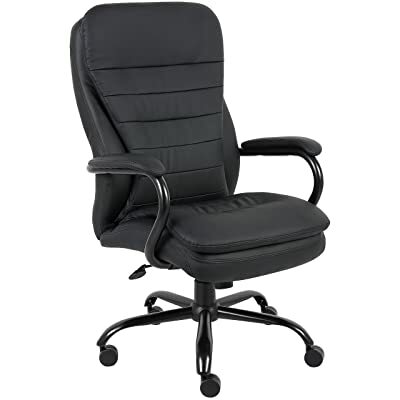 Manufacturers of both mesh chairs and leather chairs take due considerations to make chairs for over-sized people. Different attributes of the chair including the sear, arms, backrest, hydraulic adjustment, base and wheels are designed accordingly. But it must be noted that mesh chairs have lighter frames than leather chairs, making the former more prone to wear. Leather chairs are padded generously and are weightier. The extra padding makes more room for comfort and ensures that the frame of the chair does not give away due to the added tension. Moreover, having metal to it, the leather chairs are much more effective having the stamina to bear 150-200 pounds without any problem. One of the major differences that you will notice in chairs for the over-sized is their larger size. The seat and backrest are adjusted in a way that will support a larger body frame. However, you must see to it that they are in proportion to one another. A big seat and a small backrest will promote a negative posture resulting in pain. Similarly, if the chair has a large backrest with a small seat, there will be less room for the lower body and legs and lesser chances of good seating positions throughout the day. To slide away with these probable anomalies, the chair must facilitate equal distribution of tension between the seat and the backrest. Also, it is important that the chair has wider arms to accommodate an obese person. Since obesity is one of the major problems throughout the world, most chair manufacturers employ hydraulic systems in the chairs. But the consideration draws all the more attention if the chair is exclusively meant for a large bodied person. Since most of the body weight suspended on the chair bears direct pressure on the hydraulic system, a strong hydraulic system with pneumatic height adjustment is most desirable. If you are not sure about the strength of the hydraulic system in the chair, feel free to write to the manufacturer or ask the retailer about the weight that the chair will be able to support. Mostly, such chairs employ a pneumatic system that can hold up to 250 pounds of weight. But if you seek a chair that will hold even greater weights, it is advisable to order a custom made chair. The base and wheels of office chairs make an important unit in that they receive that most of the motion force from the ground. Mostly, office chairs that are designed for tall or overweight people give a lot of emphasis on the base of the chairs. Such bases are often made from pure metal with an added layer of chrome plating. For the wheels, metal wheels are most advisable in chairs for the overweight and tall. In fact, most these chairs will also employ adequate equal metallic distribution throughout the body of the chair. Choose your office chair wisely. It is up to you whether you will go for the quantity and order average strength chairs or go for the quality and order for office chairs that will not only give comfort to tall or overweight people, but to humans as a whole.